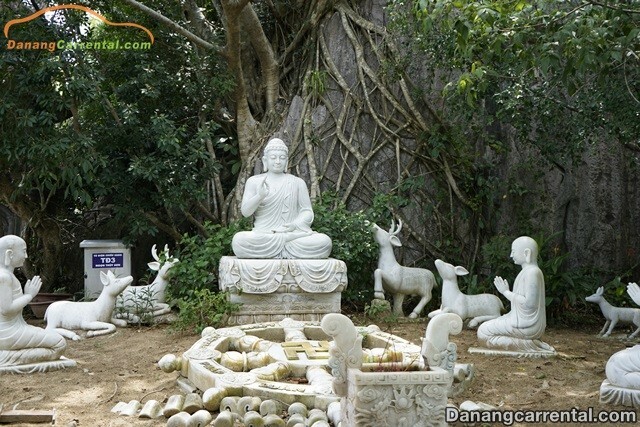 Ngu Hanh Son or Non Nuoc mountain (Marble Mountain)is a popular tourist destination in Da Nang city. In memory of many people here, this also have been the “spirit region” of the Quang people up to now. 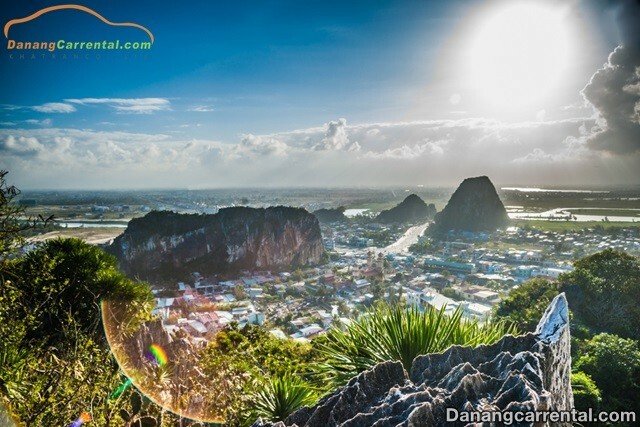 The mountain is located on a yellow sand strip about 2 kilomiters long, about 800 meters wide, which is in Hoa Hai ward, Ngu Hanh Son district and about 8 kilometers from the Southeast of Da Nang city. 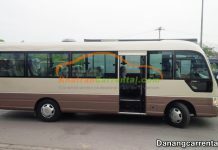 Therefore, it is very convenient for tourist to rent a car for exploring the landscapes here. According to the indigenous people, formerly Ngu Hanh Son mountain stood alone between the endless sand of the Tien Sa peninsula. Because of the impact of time, climate and many other factors, they create a lot of large caves in the mountain with unique shapes and subtle colors. There are five mountains which create Ngu Hanh Son include: Thuy Son and Moc Son in the East, Tho Son, Kim Son and Hoa Son in the West. In the Chinese’s philosophical thoughts, the five elements of Kim, Moc, Thuy, Hoa, and Tho are elements in order to construct the universe. Number 5 is extremely important number in thinking and in the life of the East, so the top 5 Kim Son, Moc Son, Thuy Son, Hoa Son, Tho Son have already contained the mysterious in themselves. Each mountain of Ngu Hanh Son has its own beauty in terms of location, shape, material, cave systems, pagodas inside. In the mountains, Thuy Son is the largest and most beautiful and the largest concentration of caves and temples. The mountain has a height of 106 meters, with 3 mountains in 3 floors like 3 stars (Tam Thai). The most interesting to visit the Ngu Hanh Son that the tourists can not find anywhere is after climbing up hundreds of steps to visit caves and pagodas, they just need to step out a few hundred meters in order to contemplate the smooth white sand and blue water with smooth waves to relax their body into salty water. Tam Thai pagoda is located on the Western side of Thuy Son mountain. 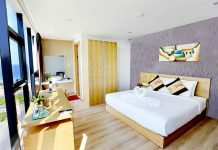 It is also a spiritual tourist destination that attracts many visitors and Buddhists to visit. The pagoda consists of 3 majestic floors and is designed basing on the word “Vuong” in the Chinese characters. In front of the pagoda is the Maitreya Buddha statue and inside the shrine is Amitabha Buddha Tathagata, Avalokitesvara Bodhisattva, Dac Dai The Bodhisattva statues. The Am Phu cave is considered to be a very special cave as its name because it is the largest as well as most mysterious and complex cave in the cave complex of Ngu Hanh mountain. In front of the cave gate is the Yin-Yang bridge, which is said to be used for the soul of the dead going over. In the Am Phu cave, there are two directions, one towards theheaven and one down to the hell. 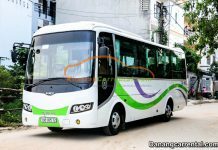 Belonging to the system of the famous landmarks in Ngu Hanh Son, Quan Am caveis visited by many visitors because there are many stalactites shape and color fanciful here. The most impressive feature of the cave is the Bodhisattva Avalokiteshvara which is holding a Cam Lo vase in her hand. The statue looks really solemn with a glittering layer of jewelry. Hoa Nghiem cave is located in Thuy Son district. It is a small cave which is only 17 meter long. 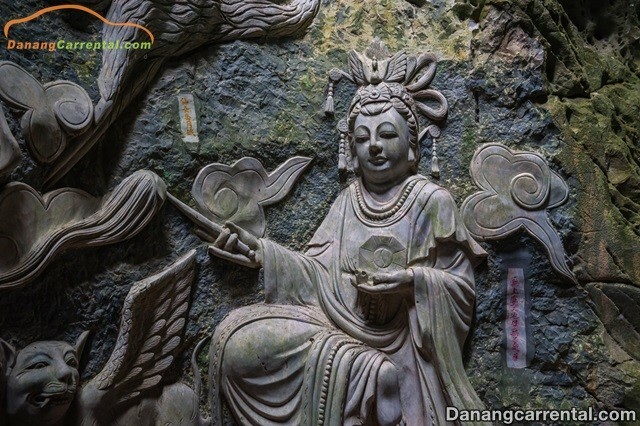 Inside the cave has the statue of the Buddha Guan Yin.There are 4 statues of Kim Cang guardians outside the door and on the wall is the rarely ancient inscriptions Linh Trung. 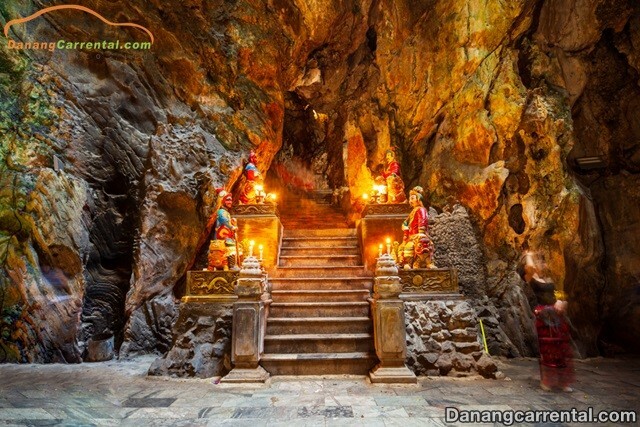 Hoa Nghiem cave is also one of the most fanciful beauty in the Ngu Hanh Son mountain. 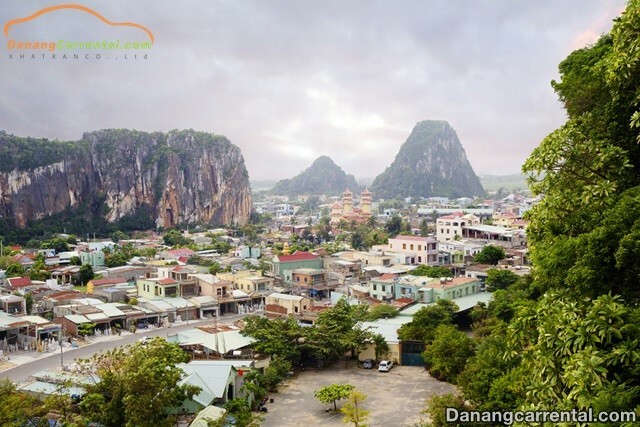 Located at the foot of Ngu Hanh Son mountain, Non Nuoc stone carving village is an indispensable stop on the Da Nang tour. Being formed in the 18th century, Non Nuoc stone carving village is one of the oldest traditional craft villages of the city. Visitors will have the opportunity to witness the skillful artisans who are skilled to make the art of stone sculptureswhich are extremely unique and impressive. 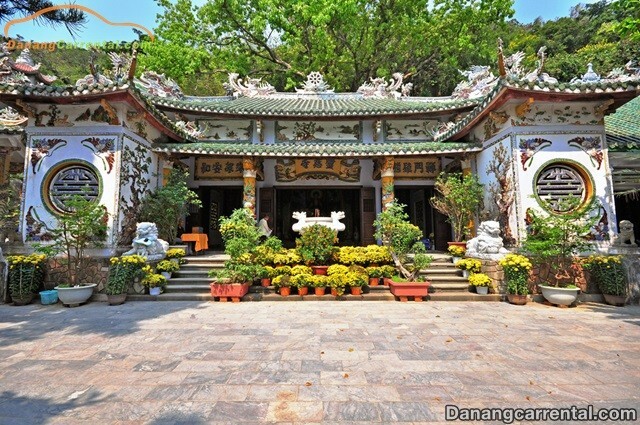 Therefore, the tourists can select a lot of meaningful gifts or visit the famous Thach Nghe To Su temple. 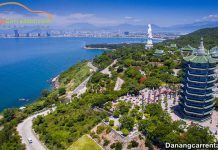 Along with Ba Na hills, Son Tra peninsula, My Khe beach,… Ngu Hanh Son in Da Nang is considered as an attractive destination for tourists when coming to the Central. Visitors can forget their all tiredness and stress from their work and daily life when stepping into the wonderful scenes. 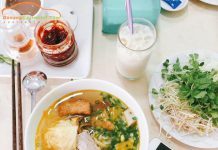 Besides that, the deep cultural values of spirituality have contributed to the magic and appeal of Ngu Hanh Son that if you arriveonce, you will not forget. 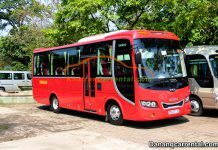 We hope to bring you an interesting information in your tour in Da Nang. 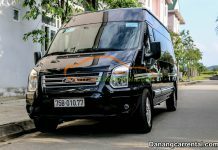 For more specific advice or rent cheap car to visit famous sites in Da Nang, do not forget to contact Kha Tran Car rental via hotline Ms Anna: (+84) 91 651 02 01 or Ms Katharine: (+84) 34 797 6789.